Report debunks myths about productivity gains, restructuring, and a manufacturing renaissance and explains what is needed for a real recovery in this essential sector. In the 2000s, U.S. manufacturing suffered its worst performance in American history in terms of jobs. Not only did America lose 5.7 million manufacturing jobs, but the decline as a share of total manufacturing jobs (33 percent) exceeded the rate of loss in the Great Depression. Despite this unprecedented negative performance, most economists, pundits and elected officials remain remarkably blasé about what has transpired. Manufacturing, they argue, has simply become incredibly productive. While tough on workers who are laid off, outsized job losses actually indicate superior performance. All that might be needed are better programs to help laid-off production workers. And there is certainly no need for a determined national manufacturing competitiveness strategy. The alarm bells are largely silent for two reasons. First, most economists and pundits do not extend their analysis beyond one macro-level number—change in real manufacturing value-added relative to real GDP—which at first glance appears stable. But this number masks real decline in many industries. In 2010, 13 of the 19 U.S. manufacturing sectors (employing 55 percent of manufacturing workers) were producing less than in 2000. 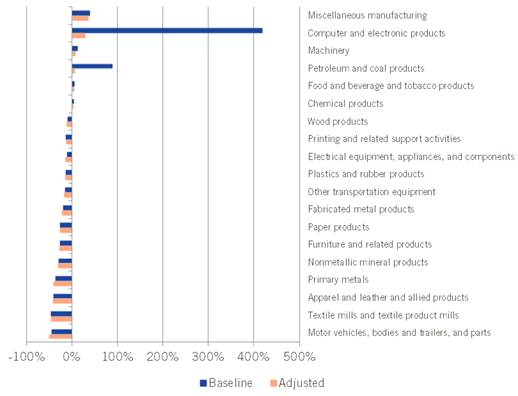 Second, and more fundamentally, U.S. government statistics significantly overstate the change in U.S. manufacturing output, and by definition productivity, in part because of massive overestimation of output growth in the computer and electronics sector and because of problems with how manufacturing imports are measured. When measured properly, U.S. manufacturing output actually fell 11 percent over the last decade while GDP increased 17 percent, something that has not happened before, at least since WWII. Moreover, manufacturing productivity grew by just 32 percent, not the reported healthy number of 72 percent indicated by Bureau of Economic Analysis data. If productivity growth was actually 72 percent, one would expect that U.S. manufacturers would have added plenty of machines and factories over the last decade to be more productive, as they have done every decade since WWII. In fact, total U.S. manufacturing capital stock increased just 2 percent, compared to historic rates of growth of between 20 and 50 percent per decade. Thus, while superior productivity increases played some role in declining manufacturing employment, the overriding factor was output decline, highlighted by a striking result: if from 2000 to 2010 manufacturing output had grown at the same rate as that of the rest of the business sector, the United States would have 3.8 million more manufacturing jobs today and at least another four to six million jobs from the multiplier effect. What so many pundits miss is the centrality of manufacturing (and other globally traded sectors like software) to U.S. economic health. In a comparison of 10 nations, including the United States there is a strong (0.57) correlation between change in manufacturing employment between 1987 and 2005 and total economy-wide employment growth from 2005 to 2010. As such, the conventional wisdom that U.S. manufacturing job loss is simply a result of productivity-driven restructuring (akin to how U.S. agriculture lost jobs but is still healthy) is fundamentally flawed. U.S. manufacturing lost jobs because manufacturing lost output, and it lost output because its ability to compete in global markets—some manipulated by egregious foreign mercantilist policies, others supported by better national competiveness policies, including much lower corporate tax rates—declined significantly. Even if experts acknowledge that manufacturing’s share of output has declined, many comfort themselves with a narrative that such decline is inevitable. “Manufacturing is in decline everywhere, even in China,” they argue. They would be wise to consult actual data, for they would find that while manufacturing has declined as a share of GDP in some nations (notably Canada, Italy, Spain, the United Kingdom, and the United States), it is stable or growing in many others (including Austria, China, Finland, Germany, Japan, Korea, the Netherlands, and Sweden). The loss of U.S. manufacturing is not due to some inexorable shift to a post-industrial economy; it is due to a failure of U.S. policies (for example, underinvestment in manufacturing technology support policies and a corporate tax rate that is increasingly uncompetitive) and the expansion of other nations’ mercantilist policies. Some go so far as to assert that manufacturing industries are “old economy” and that it is a reflection of failure, not success, if a country has a manufacturing sector that is either stable or growing. Perhaps they are thinking of the kind of factory represented in old movies, television shows, or news clips: dirty, clunky, mechanical havens filled with low- and moderate-skilled workers producing commodity products. They would be well-advised to visit the clean, streamlined, IT-driven manufacturing facilities operating in the United States today. The new facilities use advanced technologies and employ moderate- and high-skilled workers to turn out advanced products, from jet aircraft, computers and semiconductors, and advanced instruments and vehicles, to sophisticated chemical and biological compounds. Others now argue that because a few manufacturing jobs have returned that the United States is poised for a manufacturing renaissance. But the rebound looks as good as it does only because the prior loss was so steep. The United States lost two million manufacturing jobs during the Great Recession, and since then a little over 166,000, or 8.2 percent, have returned. At the rate of growth in manufacturing jobs in 2011, it would take until 2020 to return to where the economy was in terms of manufacturing jobs at the end of 2007. A large share of manufacturing jobs was lost in the last decade because the United States lost its competitive edge for manufacturing. It was due to a failure of U.S. policy, not superior productivity. The loss was cataclysmic and unprecedented, and it continues to severely impact the overall U.S. economy. Regaining U.S. manufacturing competitiveness to the point where America has balanced its trade in manufacturing products is critical to restoring U.S. economic vibrancy. Regaining manufacturing competitiveness will create millions of higher-than-average-wage manufacturing jobs, as well as an even greater number of jobs from the multiplier effect on other sectors of the economy. The United States can restore manufacturing competitiveness and balance manufacturing goods trade within less than a decade if it adopts the right set of policies in what can be termed the “four T’s” (tax, trade, talent, and technology). This issue is too important for policy to be informed by poor data and shallow analysis. It is time for economists, journalists, policymakers, and others to get the story right.